Simtars’ Principal Engineer, Andre De Kock, was the proud recipient of an ACARP Research and Industry Excellence award in September 2018. Andre was recognised for his excellence and commitment to research over many years in the IS space. His commitment, professionalism and structured approach to establishing repeatable processes to ensure equipment can be tested in a systematic way, to ensure its safety, has made great improvements in IS across the mining research industry. Simtars’ Executive Director Nicolai Ahlstrand said, ‘Simtars is delighted and immensely proud that Andre’s dedication, excellence and service to industry has been recognised. The work that Andre has done at Simtars over many years has directly enhanced industry safety outcomes’. 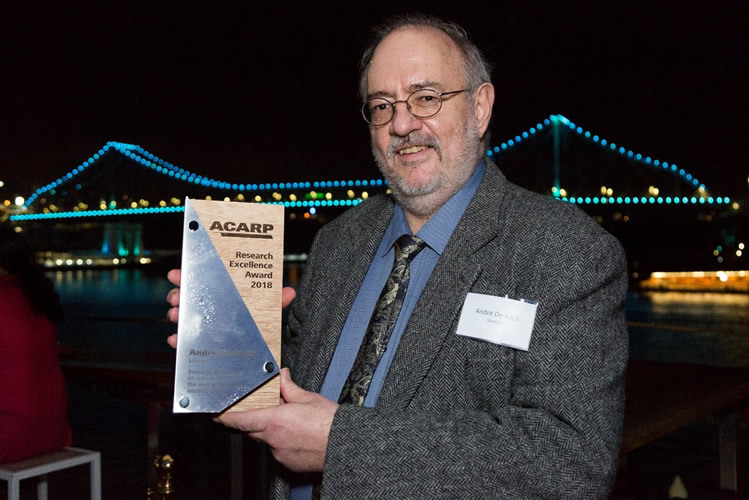 Simtars’ Principal Engineer, Andre De Kock, with the ACARP Research and Industry Excellence award.